The school newspaper never printed this forum piece that I wrote and I’m actually really upset about it. I put a lot of thought into this piece and I really wish the school would have seen it. The ALS Ice Bucket Challenge has made a huge impact across the country as of lately. Everyday someone is posting a video of their ice bucket challenge and then nominating others to partake in the challenge as well. The rules of the challenge is that when a person is nominated or challenged then they have twenty four hours to either donate money to the ALS Foundation or dump a bucket of ice water over their head and then donate money. The ALS Foundation initiated the challenge in the spring of 2014 and is exceeding its goals to raise both money and awareness for ALS. With the impact that the challenge has had across social media comes some who are opposed to the whole challenge. Instead of posting positive feedback about the challenge and the impact it has had, some have posted a meme of an African kid saying, “So, let me get this straight. 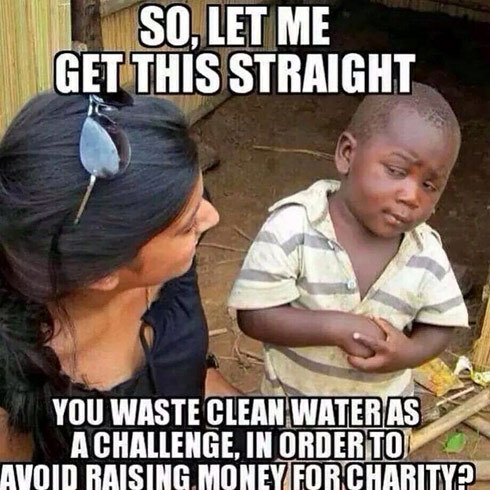 You waste clean water as a challenge, in order to avoid raising money for charity?” This meme is wrong in so many ways and the creator clearly does not understand what the point of the ice bucket challenge is. It is understandable to want to say this about the Ice Challenge that became a huge hit in April, but the ALS Ice Bucket Challenge is not the same as the Ice Challenge. The rules of the Ice Challenge are: A person challenges three people to donate money to a charity or find a way to have ice cold water poured on them, so that they don’t have to donate money. The difference between the two challenges is that with the ALS Ice Bucket Challenge, no matter what, the person still donates money. It is not just the statement about donating money that is wrong with this meme. The meme completely disregards the awareness of ALS that the challenge is building. In the last twenty years, when has there ever been a nationwide public service announcement about Amyotrophic Lateral Sclerosis? Can everybody say that they know about Lou Gehrig’s Disease or have at least heard of it? ALS has not been in the forefront with the other diseases that have raised millions of dollars. There is a whole month dedicated to Breast Cancer Awareness. There are walks held across the country every year for MS and races for all types of Cancer. ALS hasn’t received that type of recognition, ever. That is why the ALS Foundation created the challenge in the first place. It wasn’t just to raise money but to also raise the awareness of the disease. Thanks to the challenge, just about everyone on social media are now aware of ALS and the disease is finally getting the recognition that it needs. Why take away from that? Why get annoyed at someone because they are helping spread the message? Another item that is wrong with this meme is the mentioning of wasting water. There is a reason why the ALS Foundation chose ice water for the challenge. The ALS disease is the death of the upper and lower motor neurons, which are the neurons that allow your body to move. It is a slow paralysis that will encompass the entire body over a number of years, eventually leading to death. When a person dumps a bucket of ice cold water over their head, their body can become numb which is symbolic of the patients who have ALS and what they are going through. As for the water, people technically aren’t wasting it. People tend to do the challenge either outside or in their showers. When taking the challenge in the shower, the water will just drain back into the water system. When taking the challenge outside, people are still not wasting water. Yes the water is getting dumped onto the ground, but it will soon evaporate into the atmosphere in what is called, “The Water Cycle.” Everyone who has gone to grade school knows that with the Water Cycle, the so-called wasted water will eventually make its way back into the water system. People should stop getting so hung up about the popularity that the challenge is getting and start thinking about the cause. There is no cure or prevention for ALS and the donations to the foundation are being used to help find a way to help lower the process of the disease. In fact, the ALS Foundation has received close to 100 million dollars in donations because of the ice bucket challenge. The facts are clear. All of the people who have “wasted” water are actually making a difference in the world. They’re helping a cause in a much bigger way than it looks in the video that they upload to Facebook or YouTube. People aren’t dumping the ice water over their heads to escape the cause. They’re doing it to help the cause.